This is a bang-together butter to dress up a grilled meal. My dad halves butternut squash lengthwise, removes the seeds and grills, skin and all, until tender when pierced. It looks fab and tastes great. Does it need the butter? Well, probably not, but sometimes you just have be generous with yourself and go for the extra unctuous goodness. Spin the shallots and sage together in a food processor (or mince really fine and mix well). Add remaining ingredients and mix well. You may place in a dish and chill, or roll into a tube, wrap in plastic wrap and freeze, cutting off thin disks a needed. 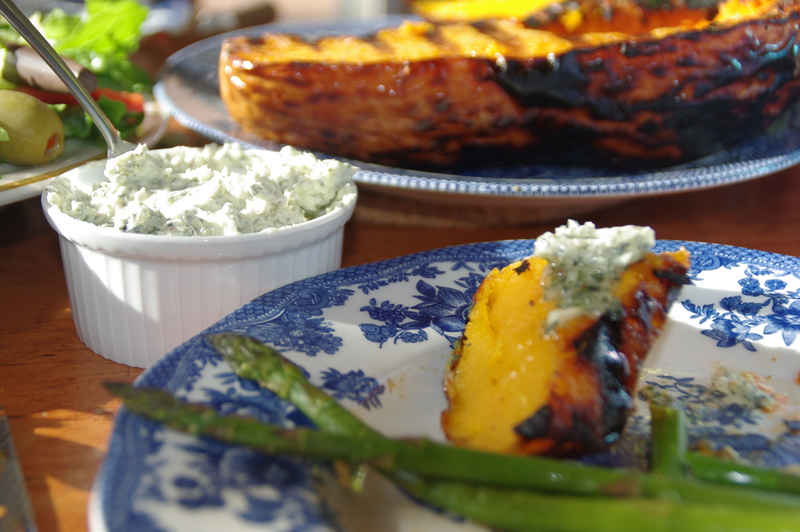 Dollop over grilled butternut squash or steak, or slather on bread. ← Tostones: Puerto Rican French Fries – Made of Plantains! Herb butters are so easy to make. They a great way to preserve the herbs in your garden at the end of the growing season. I love sage with butternut squash, now I’ll try it on steak. Thanks for stopping by! I usually use garlic in my herb butters; this was a nice change! I love herb butters on anything. This looks great. Nothing better than butternut, sage and butter! Hi T.W. I find it so strange when I’m tagging posts now in the farm off-season to realize that farming and CSA are not part of my blogs!!!!! Don’t you?